Tomas Rosicky has signed a new Arsenal contract after battling back to form and fitness this season. 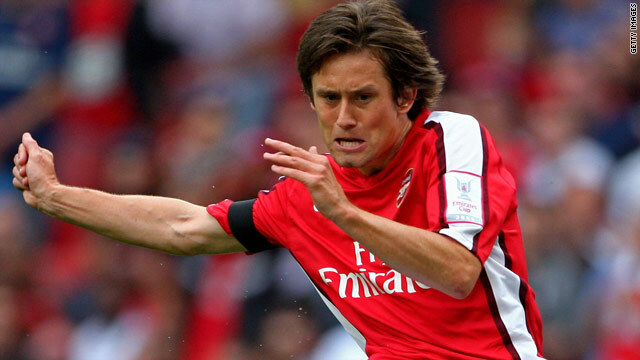 (CNN) -- Arsenal midfielder Tomas Rosicky has signed a new contract at the Emirates Stadium, the club have announced. The Gunners have not disclosed the length of the deal but it continues the club's success in securing the future services of their key players. The Czech international, who joined the club from Borussia Dortmund in 2006, is the 15th player to sign a new contract for manager Arsene Wenger since May 2009. The deal also rewards the 29-year-old, who has scored 14 goals in 76 appearances, for his performances this season after two injury-blighted campaigns. Rosicky told the club's official Web site: "The last two seasons haven't been easy for me because of injuries but I feel it speaks volumes about the club's belief in me for this to be signed, and I truly believe I have a lot left to offer the club, my team-mates and all the supporters. "It's felt like home since I arrived here four years ago and I believe we're on the verge of achieving something special together. "I'm looking forward to the coming months and hope that together, we are all celebrating at the end of the season." Tomas is a special talent and we're delighted that he has committed his future to Arsenal. Rosicky follows Robin van Persie, Abou Diaby, Eduardo, Alex Song, Denilson, Theo Walcott and Aaron Ramsey in signing new contracts in the past year. Wenger said: "I have spoken many times of Tomas' class and contribution, not only on the pitch but off it as well, and I very much feel that this new contract reflects that. "Tomas' vision and touch is remarkable and I know that we will all benefit from his input in the coming seasons. "Tomas is a special talent and we're delighted that he has committed his future to Arsenal."